We live in a world in which inconsistency is the rule rather than the exception and this is particularly true for rewards and frustrations. In some cases, rewards and frustrative non-rewards appear randomly for what seems to be the same behaviour; in others a sequence of rewards is suddenly followed by non-rewards, or large rewards by small rewards. The important common factor in these and other cases is frustration - how we learn about it and how we respond to it. 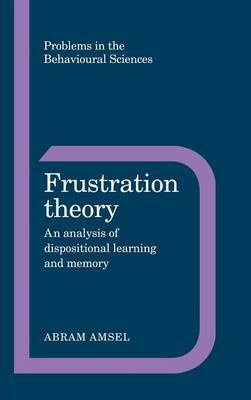 This book provides a basis in learning theory and particularly in frustration theory, for a comprehension not only of the mechanisms controlling these dispositions, but also of their order of appearance in early development and, to an approximation at least, their neural underpinnings.